Nobody thought Elizabeth Merrill ’00 and Lawson Rudasill ’00 would become a couple. Sure, they were good friends at Bates. Sure, they kept in close touch after college. Sure, they slow-danced together at their Bates friends’ weddings. Sure, they had the same wacky sense of humor, were on the same wavelength, were completely comfortable with and accepting of one another, and had grown only closer over the past 20 years. Despite all that, their friends never predicted their getting together. 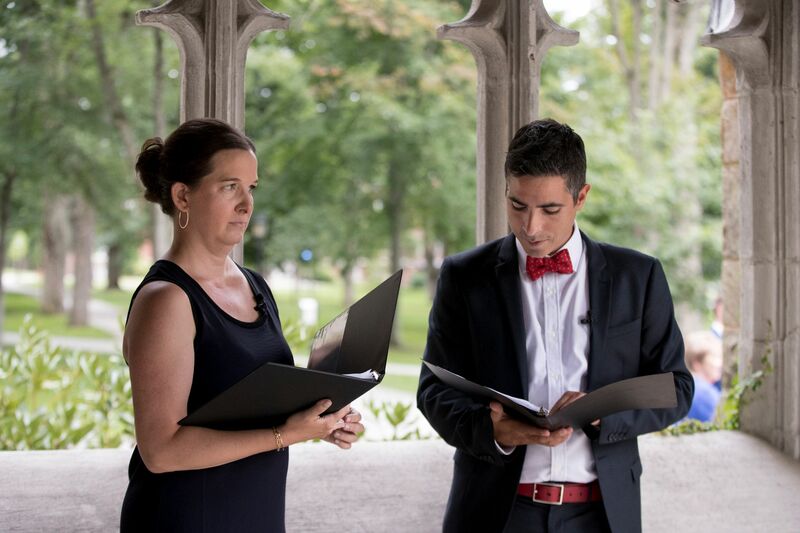 “But the more they saw each other and reflected on it, the more they realized what nobody anticipated: that a romantic relationship felt right,” as their good friend Cynthia Macht Link ’00, a co-officiant at their wedding in August, said during the ceremony in the Peter J. Gomes Chapel. 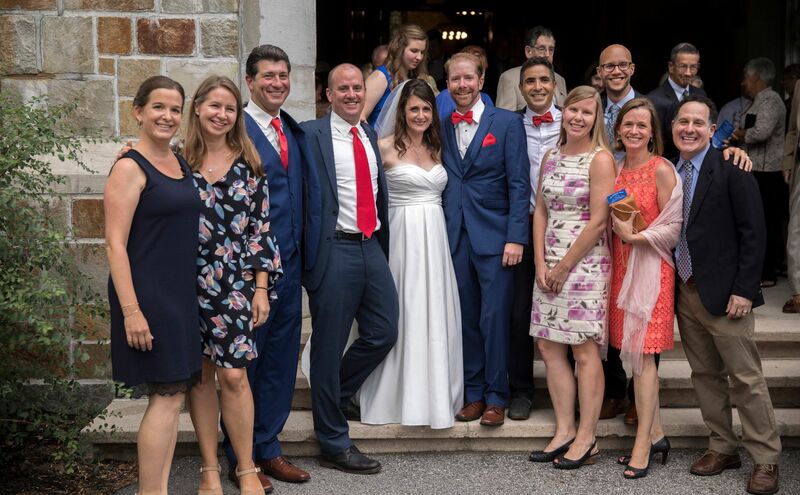 The Bates-at-Bates wedding was just like what you’d see in the wedding photos in Bates Magazine — with classmates and alumni who’d become close during college and remained close over two decades, moves, marriages, and children. 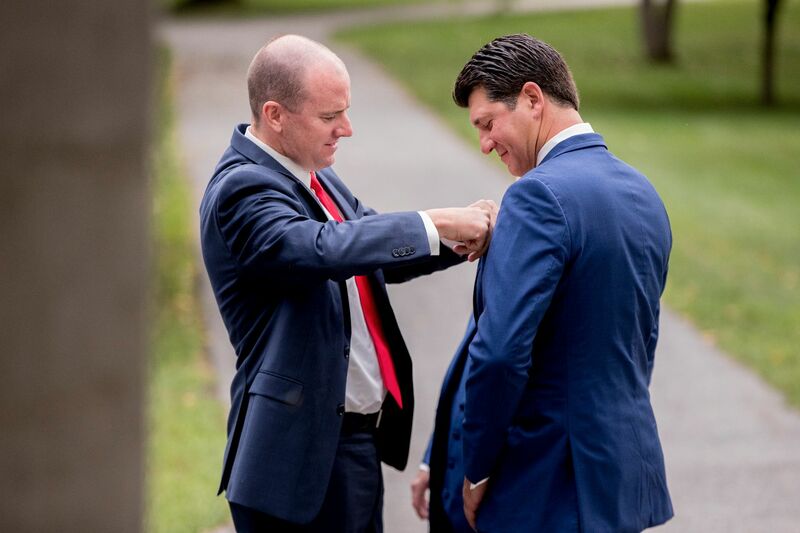 During their sophomore year, Merrill and Link were rooming together, and Rudasill was roommates with Ed Pauker ’00, Ted Martin ’00, and Mark Douthat ’01. The two sets of roommates found kindred spirits in each other. They moved to suites across the hall from one another in John Bertram Hall during their junior year, Kate Dodson ’00 and Abigail Goen Helfat ’00 joining Merrill and Link. They played foosball in the men’s dorm room, went to each other’s hockey and Ultimate Frisbee games, and threw parties. 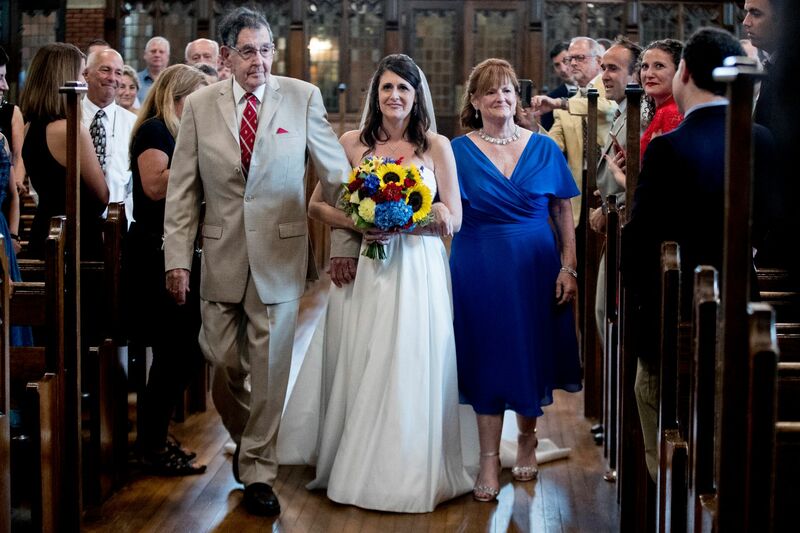 “We had such a good circle of friends with Liz and Cynthia and others,” said Ed Pauker, the other co-officiant at the wedding. “Liz and Cynthia would show up at the dorm and it would turn from being four boys with stained jeans, to an actual party. “I think our relationship was very chummy, very silly. As a group we were dorky and ridiculous,” said Merrill, interviewed along with Rudasill before their wedding. “It was, who can make the other person laugh the most?” Rudasill added. During their junior year, the group threw a surprise party for Jon Adler ’00. Merrill and Rudasill described the scene in the basement of JB as raucous, like most of their parties. After graduation, Merrill, Rudasill, and their friends went their separate ways. Rudasill moved to Colorado, then worked in politics in Missouri before returning to Champaign, Ill., his hometown. Merrill worked in Massachusetts before earning a doctor of psychology degree at the Wright Institute and then settling in New York City as a psychologist. Rudasill married and divorced; Merrill “dated a lot,” she said. The two friends kept in touch. They went to Bates Reunions, and when Facebook came out, they talked over Messenger. They went to Bates friends’ weddings and visited them when they had kids. “We loved to swing dance, so we were always swing dancing together at every wedding,” Merrill said. But for nearly 20 years, dating didn’t occur to either of them, or to their friends. Still, theirs was a valuable friendship. “The main thing about them is that Elizabeth and Lawson are completely accepting of each other exactly as they are,” Link said. By 2014, both Merrill and Rudasill were both single again, still living half the country away from each other and talking over the phone and Facebook Messenger. Slowly, the qualities that made them such good friends made them think something more was possible. To “test the waters,” Merrill said, in January 2015 the pair met in Minneapolis and stayed with Rudasill’s old roommate, Ted Martin. At Martin’s house, a romance finally blossomed. Rudasill and Merrill dated long-distance at first, talking for hours over Skype and visiting each other around the country. Just a few months after that fateful trip to Minneapolis, Merrill moved to Champaign, getting a job at the Veterans Affairs hospital. Harking back to their college days, the couple threw themed parties — murder mystery, ’90s, pajama. They traveled around the Midwest and South, and back to Bates for the Reunion of Merrill’s father, Jack Merrill ’56. 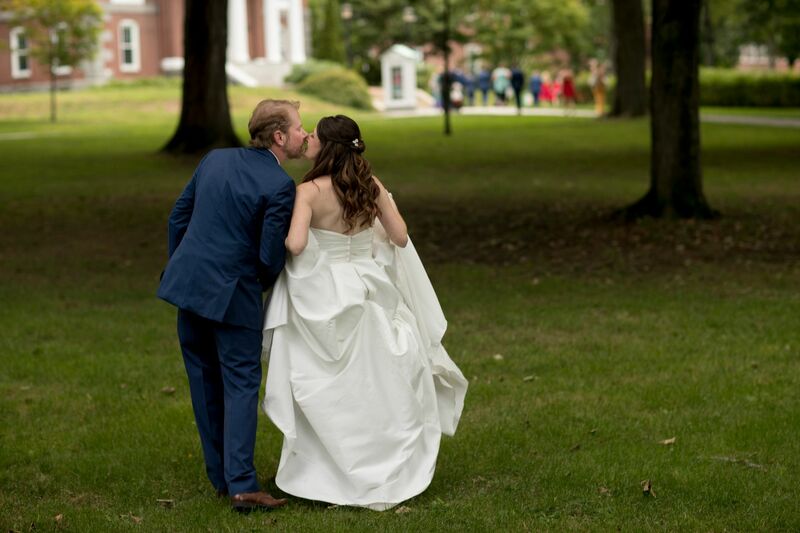 Their relationship brought their friends closer together, Pauker said, especially after they got engaged and secured one of the limited opportunities to have a reception at Bates. 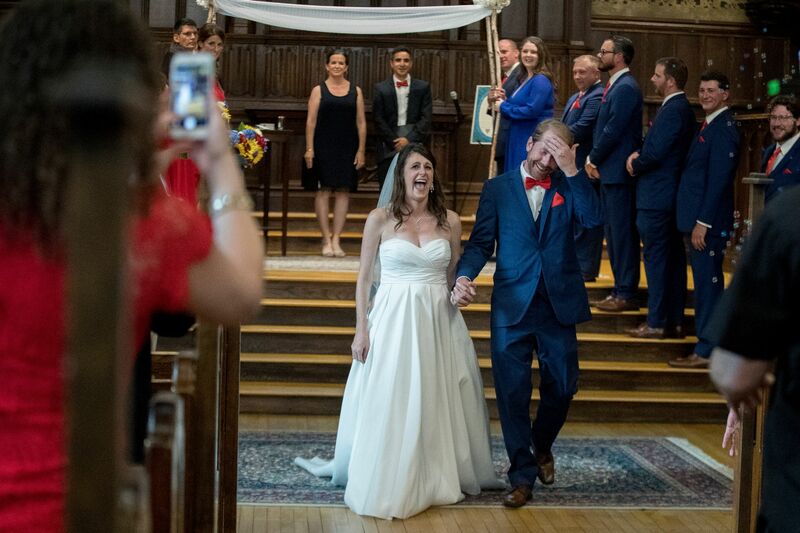 For Merrill and Rudasill, a Bates wedding, though more than a year of conversations with Conferences and Campus Events in the making, would not be a destination wedding — the couple moved to Portland, Maine, this year. 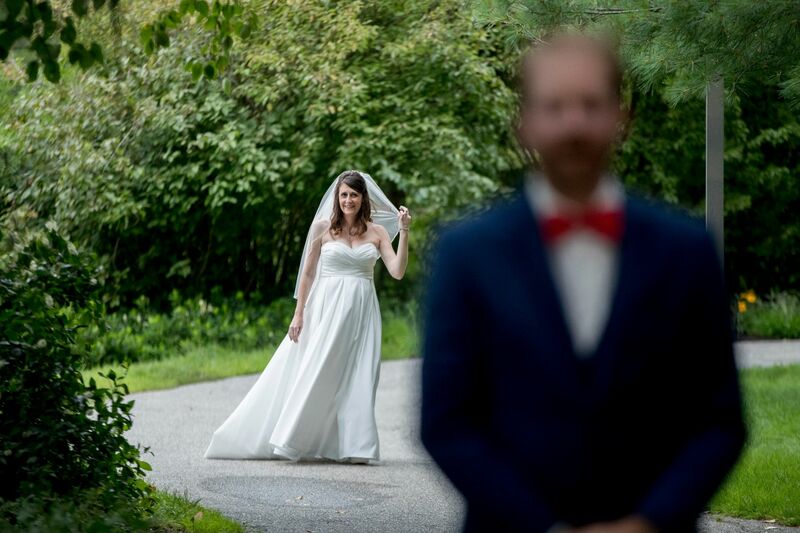 The couple’s rehearsal dinner in Poland, Maine, on Aug. 17 contained an extra surprise. Merrill and Rudasill had been trying to have a baby since 2016, Merrill wrote about their experience with IVF in the Huffington Post. They finally conceived this year, and at the dinner, they announced they were having a girl. 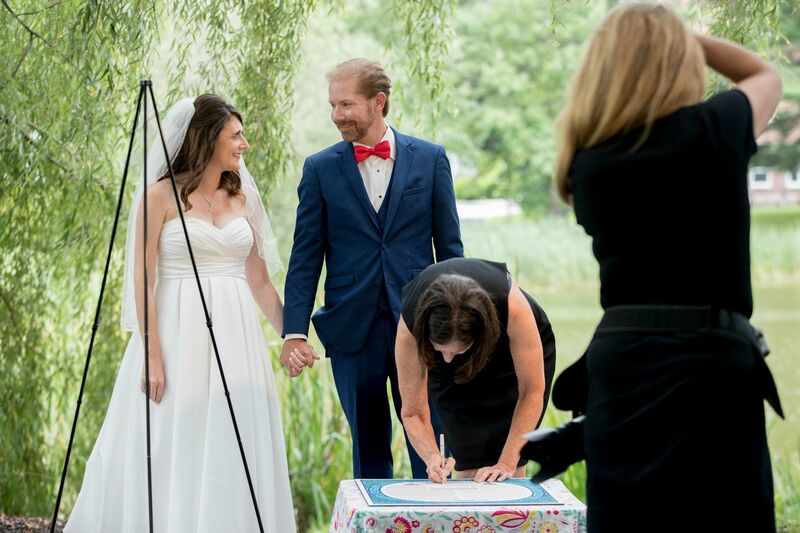 The following day, rain threatened but held off long enough for the bride and groom to take pictures and sign the Ketubah by the Puddle. 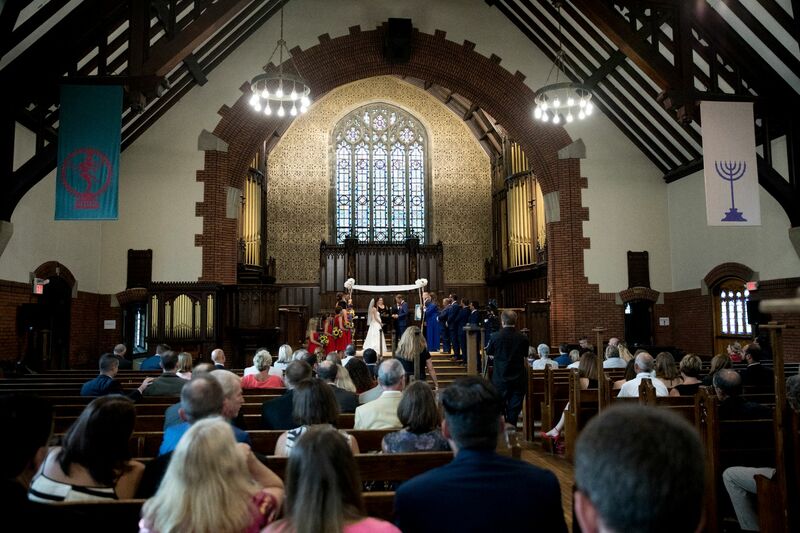 The Jewish ceremony in the Gomes Chapel was officiated by Link and Pauker, and Martin was a holder of the chuppah, a canopy under which Jewish couples marry. Douthat was a groomsman, Rachel Bobruff ’00 a bridesmaid, and Merrill’s sister Lauren Faison ’02 the matron of honor. A reception in Pettengill Hall’s Perry Atrium followed. Tables were named after meaningful Bates places, like Commons, the Puddle, and JB. A jazz guitarist, Professor of Physics and Astronomy John Smedley played with his quartet, and the Bates Bobcat made an appearance during dancing. 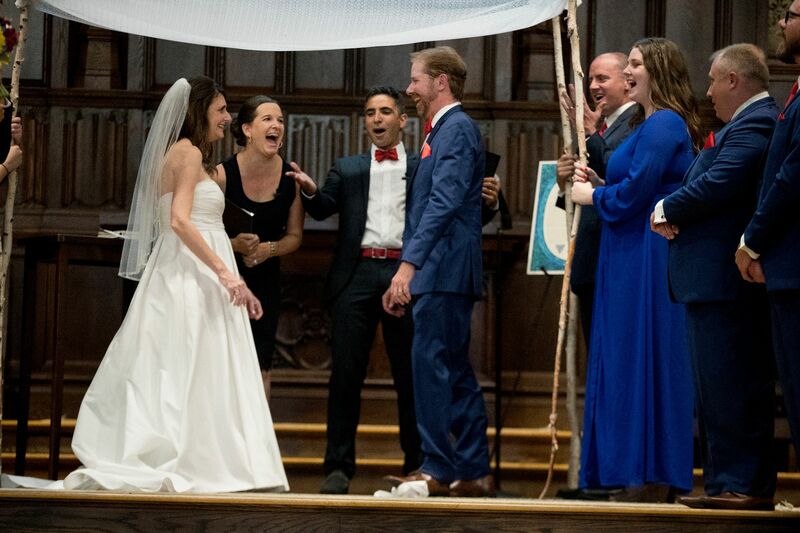 During the ceremony, Link told the gathering of Bates friends that Merrill and Rudasill understood each other’s likes, dislikes, strengths, and weaknesses; that as old friends they respected each other, accepted each other, and could be vulnerable with each other.